Bicycle Brakes, learn all about 'em! Bike Kitchens are where you get to learn bike stuff guided by our friendly and experienced bike mechanic. And there's coffee and cake - bring nibbles to share too if you like. Next one is all about yer brakes. Saturday 3rd August 11am to 12.30. Get in touch to reserve a place or try your luck and just turn up (no-one's been turned away so far). £5 suggested donation. Track Pump hosted by Wivenhoe Library!! After a few false starts I finally manage to pluck up the courage and prepared the bees for a journey to Bennisons farm in my car. When I arrived at the farm the good weather was beginning to break and summer was here, good for the bees. I sited the hive in a slightly exposed area and left them to settle in. The next day an early start at work meant I had an even earlier start with the bees 05:45. When I released the bees it was a sight to see, they poured out of the hive to investigate their new surroundings. I left the bees to do just that and I went off to work. All day I was worrying about the bees, my fear was the bees would swarm and I would loose them. To my delight the bees have decided to stay and help pollinate the fruit trees and alike. So we now have bees on the farm, phew! If anyone would like to get involved with the bees please get in touch I would very much like to share my interest with you. Yesterday Maureen and I had lots of fun with the chickens at the community chicken project coop. We thought - mistakenly as it turned out - that one of our girls had been escaping over the fence and taking herself on adventures about the village. So we postulated that it must be time to re-trim all those flight feathers (which allow them to take off). After trimming nearly all our birds however, we realised that we had an extra one which was not ours! Almost identical to ours, but definitely not ours! It then 'clicked' that this was probably the one which had been spotted wandering around the village - and taken for one of ours - and that we had trimmed the feathers unnecessarily. However, no harm done as it doesn't hurt them at all. 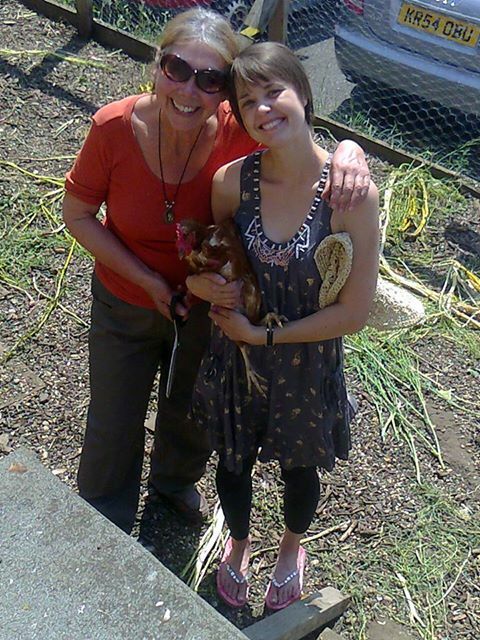 We eventually tracked down the owner of the rogue chicken and returned her to her rightful coop. Apparently she really likes to go on walks and seemed to enjoy her time with our girls. Which was interesting, because we'd been led to believe that any new birds arriving in the coop are usually picked on terribly and bullied by the existing flock. It's nice to know that our girls extended a truly "Warm Wivenhoe Welcome" to the visiting bird. So please do not be alarmed if you see lots of feathers on the floor of the coop - it was not a fox! Many thanks to the Station Pub and all those lovely members of the community who at various points reported the wandering bird and put it into our coop. We are happy to receive any lost chickens as a 'holding pen' until rightful owners are found if it happens again in future.